SEPOY (AUS) (Chestnut 2008-Stud 2012). 10 wins-5 at 2, ATC Golden Slipper S., Gr.1. Sire of 415 rnrs, 214 wnrs, 11 SW, inc. Alizee (ATC Flight S., Gr.1), Unforgetable Filly, Native Soldier, Indian Blessing, Marcel From Madrid, Dabyah, Kilmah, Divine Quality, Sparkle'n'joy, Baileys Showgirl, Khukri - Brilliant Debbie (Mac. ), SP Counterplay, Garrard, Han Xin - Sun Marshal (Sing. ), It's a Myth, Chipanda, Fullazaboot - Hello Beauty (H.K. ), Acqume, etc. Vahana (f. by Sepoy). 2 wins. See below. Indigenous Star (g. by Exceed and Excel). Winner at 1600m in 2017-18, HKJC New Stars for Kitchen H., 2d HKJC Lotus Bridge H., 3d HKJC Solar Hei Hei H., H Moser & CIE Excellent H., Lukfook Love is Beauty Collection H., Cineraria H., Kose Cosmeport H.
Anyoakee (f. by Flying Spur). Placed at 3 in Aust. Mizzandi (g. by Mizzen Mast). Placed in Aust. Buthelezi (Dynaformer). 8 wins-2 at 2-from 1m to 2½m, £120,219, Newmarket Racing Welfare H., Doncaster Powell Engineering Nursery H., Ayr Jordan Electrics Ltd H., Musselburgh Balmoral Cup, 2d Newmarket Fairway S., L, Easyjet London Southend Airport H., Talk Night Club 2YO S., 3d Newmarket Princess of Wales's S., Gr.2, Doncaster Williamhill.com on Your Mobile! S., 4th Newbury Geoffrey Freer S., Gr.3. Selection Sunday. 5 wins-1 at 2-from 1m to 19f, US$262,960, Charlotte Queen's Cup MPC Hurdle, 2d Saratoga Jonathon Kiser Novice Hurdle. CETEWAYO (His Majesty). 11 wins-1 at 2-from 8½f to 1½m, US$1,170,257, Saratoga Sword Dancer H., Gr.1, Gulfstream Park Breeders' Cup H., Gr.1, Aqueduct Red Smith H., Gr.2, Belmont Bowling Green H., Gr.2, Arlington Park Stars & Stripes H., Gr.3, Pimlico Riggs H., L, Philadelphia Park Greenwood Cup, L, Laurel Sir Ivor S., L, 2d Belmont Turf Classic S., Gr.1, Woodbine Sky Classic H., Gr.2, Gulfstream Park Pan American H., Gr.2, Keeneland Sycamore S., Gr.3, Pimlico Riggs H., L, 3d Belmont Turf Classic S., Gr.1, Aqueduct Red Smith H., Gr.2, Keeneland Elkhorn S., Gr.3, 4th Kentucky Cup Turf H., Gr.3. Sire. ALJEZEERA (Frankel). 3 wins-1 at 2-at 1600m, 2800m to 2018, Yarmouth Beckford S., L, Saint-Cloud Prix Balbo, 2d Doncaster Park Hill S., Gr.2, 3d Newbury Fillies' Trial S., L, York Galtres S., L.
BOWMAN MILL (Kris S). 4 wins-1 at 2-from 1m to 11f, US$457,142, Woodbine Sky Classic H., Gr.2, 2d Hollywood Turf Cup, Gr.1, Delaware Park Kent S., Gr.3, Laurel Japan Racing Association S., L, 4th Woodbine Canadian International S., Gr.1, Niagara H., Gr.2, Fair Grounds Woodchopper H., L.
NTOMBI (Quiet American). 3 wins. See above. Fort Nottingham (Alleged). Winner at 2000m, Evry Prix Longus, 3d Longchamp Prix Lupin, Gr.1. Thabazimbi (Empire Maker). 6 wins from 1600m to 2400m, Maisons-Laffitte Prix Dicta Drake, Keeneland Allowance, 2d Longchamp Prix Beachcomber Hotels, 3d Belmont Bowling Green H., Gr.2, Churchill Downs Louisville H., Gr.3, Maisons-Laffitte Prix Pleben. WILLCOX INN (Harlan's Holiday). 6 wins-1 at 2-from 1m to 9½f, US$1,015,543, Arlington Park American Derby, Gr.2, Washington Park H., Gr.3, Hawthorne Derby, Gr.3, Arlington Classic S., L, 2d Keeneland Turf Mile S., Gr.1, Fair Grounds Mervin H Muniz Jr Memorial H., Gr.2, Pimlico Dixie S., Gr.2, 3d Keeneland Turf Mile S., Gr.1, Breeders' Futurity, Gr.1, Breeders' Cup Juvenile Turf S., Gr.2, Sam Houston Park John B Connally Turf Cup, Gr.3. Sire. Francisca (Mizzen Mast). 2 wins at 8½f, 9½f, 2d Fair Grounds Pago Hop S., L, 3d Fair Grounds Blushing KD H., L.
Bryntirion (Bering). Winner at 2, 2d Hollywood Park Cinema H., Gr.3, Evry Prix Saint-Roman, Gr.3, 3d Arlington Classic S., Gr.2. Lily the Pink (Rahy). 3 wins at 1m, 8½f, US$243,953, Keeneland Allowance, 2d Kentucky Downs Ladies Turf S., L, 3d Canterbury Park Minnesota HBPA Distaff S., L.
SEASPEAK (Mizzen Mast). 3 wins-1 at 2-from 1m to 9f, US$270,262, Lone Star Park Dallas Turf Cup, Gr.3, Churchill Downs Allowance, 2d Keeneland Bryan Station S., Gr.3, Churchill Downs Commonwealth Turf S., Gr.3, 3d Churchill Downs Firecracker H., Gr.2, Grand Canyon H., L, 4th Saratoga Bernard Baruch H., Gr.2. INNOVATION ECONOMY (Dynaformer). 4 wins-1 at 2-from 1m to 2m, US$272,503, Belmont Gold Cup Invitational S., L, Keeneland Allowance. TRUST FACTOR (Paddy O'Prado). 8 wins at 1m, 8½f, US$335,958, to 2018, Louisiana Legends Turf S., L-twice, Fair Grounds Dixie Poker Ace S., L, 2d Fair Grounds Dixie Poker Ace S., L, Louisiana Cup Turf Classic, L.
J R 'S HOLIDAY (Harlan's Holiday). 3 wins-2 at 2-at 1m, 8½f, Gulfstream Park Kitten's Joy S., L, 2d Keeneland Transylvania S., Gr.3, 3d Gulfstream Park Armed Forces S., L, The Vid H., L, 4th Gulfstream Park Palm Beach S., Gr.3. Stormy Len (Harlan's Holiday). 2 wins-1 at 2-at 7f, 1¼m, US$272,547, 2d Arlington Park Secretariat S., Gr.1, 3d Woodbine Northern Dancer Turf S., Gr.1, Arlington Park American Derby, Gr.3. Shadow Banking (Harlan's Holiday). Winner at 2, 2d Belmont Pilgrim S., Gr.3. Profiteroles (Afleet Alex). 3 wins-1 at 2-at 1m, 8½f, 2d Monmouth Twin Lights S., L, 3d Aqueduct Memories of Silver S., L, 4th Monmouth Desert Vixen S., L.
Race Record: 5 Starts 2-2-0 A$40,200. 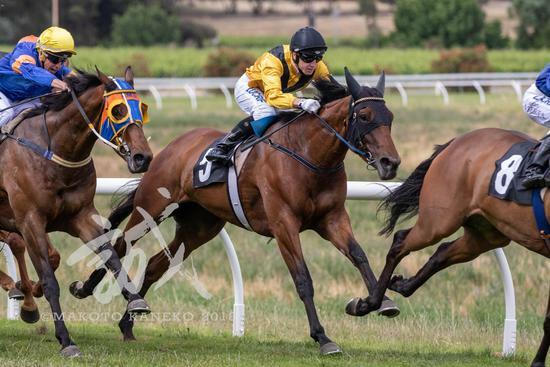 2 wins at 1050m, 1100m to 2018-19, SAJC Schweppes P., 2d SAJC Adelaide Festival of Racing H., Hughes Limousines H.